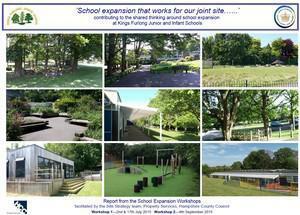 In July 2015 and September 2015, over 20 parents, pupils, governors, architects and designers met to discuss the ’bigger picture’ of the whole joint school environment and the buildings and the grounds for each school. You can read the reports on the Latest News Documents page. A huge thank you to everyone that took part, especially our pupils who presented so well in front of the adults.